Welcome to Sci-Fi Sundays at Deptford Cinema. Join us for an afternoon movie on the last Sunday of the month. With quarterly themes, our 2018/2019 programme delves into wibbly wobbly timey wimey stuff, Earthly welcomes, post-Earths, new flesh and everything in between when it comes to our favourite Science Fiction cinema. Alongside each screening we’ve organised a little something extra; quizzes, short-films, panel discussions and much more. Our first theme is TIME, a staple of science fiction that had us struggling to narrow down a huge list of great time travel films. A space station orbits the oceanic planet Solaris, monitoring and observing the world for signs of life. After a series of strange and impossible reports from the crew members aboard including his friend Dr Gibarian, psychologist Kris Kelvin is sent to the station to determine the wellbeing of the crew and whether the mission should be abandoned. On arrival Kelvin finds the station in a state of disrepair. The remaining crew members are evasive, preoccupied by private matters; his friend, Dr Gibarian, has killed himself. He catches glimpses of other people on the station – occupants who were not part of the original crew. One morning Kelvin wakes to find his late wife, Hari, in his quarters. She has no recollection of how she got there but can remember their life together perfectly. After his initial horror, Kelvin begins to accept her presence, but the uncomfortable question remains: who, or what, is she? One of cinema’s true pioneers, Andrei Tarkovsky made just 7 films over his career but left an indelible mark on the medium. 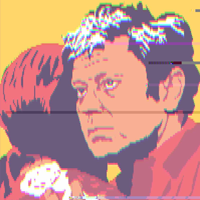 Solaris, released in 1972, is the film in which he came closest to answering a question that had permeated through his entire career: what does it mean to be human? Along with 2001, Solaris is one of the most profound and visionary science fiction films ever made. Stranded on a distant planet, a lonely astronaut sends out a signal in search of human contact. Katy Wang is an animation director in London represented by Partizan. She recently graduated from Kingston School of Art having studied Illustration Animation BA(Hons), and 'Contact' is her graduation film from this course. In 2017, she was named one of It's Nice That's 'Graduate of the Year'. Her previous work includes the award-winning ‘Mind the Gap’ that she made in her first year of study, in 2015.